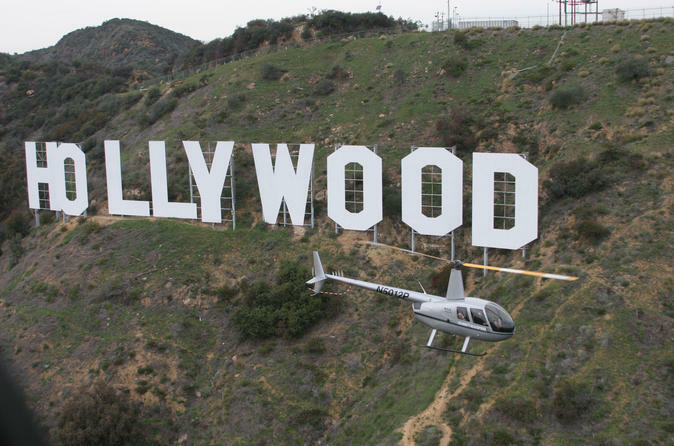 Take to the skies to experience Los Angeles and Hollywood in a whole new way on this exhilarating helicopter tour. Choose from three different flight itineraries to suit your interests: Fly over the glamorous Hollywood Strip, admire LA's beautiful coastal cities, or spot the luxury celebrity mansions of Beverly Hills and Bel-Air. Each flight includes informative commentary from an expert pilot, and hotel pickup and drop-off is available. Your helicopter flight departs from Compton Woodley Airport. You can choose to drive to the heliport yourself or enjoy round-trip transport from your Los Angeles or Hollywood hotel. Hollywood Strip Get amazing views of Hollywood and the massive sprawl of Los Angeles on this 20-minute flight. Graze over the skyscrapers of downtown LA and the Los Angeles Coliseum, USC and Paramount Pictures, and continue over glitzy Hollywood Boulevard and the Dolby Theatre, the Capitol Records Building, the Staples Center and the Nokia Center. Fly over the Griffith Park Observatory and pass right in front of the Hollywood Sign for an up-close view of this world-famous icon.